Recently I wondered if anyone was actually still into the cheap, off-brand drills like the ones you might find at Costco and the like. 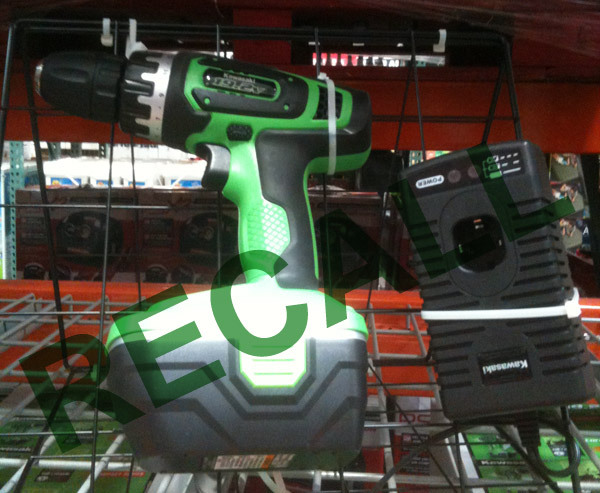 The Kawasaki drill I found (above) was fully stocked and looked okay for a heavy NiCad affair. A little bit later I saw the recall for the trigger switch, which “can short and generate excessive heat, posing a burn hazard.” I wondered if this was the same drill. Though the recall notice says the bad drills were only sold at Costco between May 2011 and February 2012, I went back a week ago and flipped the floor model on display over and its serial fell into the listed group. It could be just that the floor model is old and these are replaced units, or it could be a stack of leftovers waiting to be moved. Buyer beware. In any event, if you’ve got one, send it in. A Kawasaki drill – hmmm, maybe I’ll wait until Harley Davidson goes into the power tool business. Kawasaki is (was?) a motorcycle – right? On the other hand, my neighbor drives a Hyundai and watches a Hyundai TV! I’m a sucker for a cheap cordless drill or any tool for that matter. I have six but the harbor freight drill master was the cheapest. Only twenty bucks. Two years later it still works. But my dewalt is my favorite.